where miracles of health and longevity have become part of our daily lives. 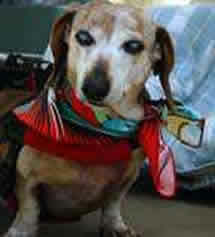 BrightHaven is a non-profit organization dedicated to the well-being of senior, disabled, and special animals. BrightHaven exists because of donations from people like you. Please consider a tax deductible donation today. They are all cared for with classic homeopathy remedies suited for the individual animal and the disease it has. All felines and dogs are fed the raw meat food diet that is natural to that animal. It is utterly amazing to see how long these felines and dogs live when cared for this way–most have come to BrightHaven after years of the nutritional abuse which has caused so many health issues. Feline Instincts has to wonder how much longer our felines and dogs would live if we started them on a balanced raw meat cat diet and homeopathy care from day one. BrightHaven has shown me that we could easily see our fur friends living healthy years beyond the age of 30 if we feed balanced raw meat food diets and provide Classic Homeopathic, chiropractic and acupuncture treatments when necessary. 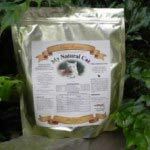 Feline Instincts has the honor and privilege of donating their products to the BrightHaven animal sanctuary where homeopathy and holistic care is embraced every day. BrightHaven animals have eaten a natural raw meat food based diet, with the foundation of good supplements (Feline Instincts of course!) and lots of love, for eons – well approximately 14 years! Many of our felines have thrived, living well into their twenties and even thirties too (!!) on our balance of care, consisting primarily of homemade raw meat diets, classical homeopathy and lots of love. In this photograph you see our feline named Trevor as the only feline with any food left on his plate. Trevor would like you to know that, when a feline chap reaches the grand old age of 26 years, one deserves to eat a little slower and savor every moment! Feline Gingi – At 17 years his medical problems are almost too numerous to mention he says! Briefly…Hit by car at 3 years, and thereafter unable to urinate or defecate by himself, not to mention the loss of his tail after the accident. Almost lost his life to a diaphragmatic hernia which had his liver and spleen wrapped around his heart and saved by an amazing surgery: Dr Gayle Donner. Developed Feline Lymphacytic Plasmacyctic Stomatitis which resulted in the loss of all his teeth, followed by chronic feline bronchitis. 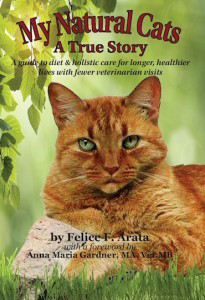 Feline Gingi eats a natural homemade raw meat food diet and is treated homeopathically: Dr Larry Bruk. Johnnie, known as Johnnie Angel, is the sweetest 5 year old feral feline known to the human world. He is healthy as can be on a wonderful diet!! 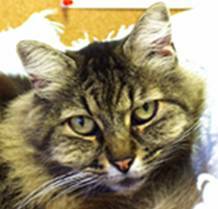 Feline Sammi is next – a sweet plump feline girl around 7 years old. Also ex-feral feline and she would dearly love to get her teeth into Trevor’s left-overs!! On the other side of Trevor is Fred, who is another ex feral feline boy, this time an elderly teenager with a liver that gives him trouble from time to time. Fred loves his homemade raw meat cat food and also his homeopath: Dr Christine Barrett who, incidentally is BrightHaven’s supervising veterinarian and cares for many of the animals, including Trevor! On 2008. On the left you see Gingi (17) curled with Vancouver (11) . Vancouver – Amazing story – Came to us diabetic – then diagnosed feline hyperthyroid – really high WBC – swollen inguinal glands – high renal values. First he became non feline diabetic, now he tests normal thyroid, his glands no longer swollen,.but still has renal insufficiency. We wonder what will happen next! His vet is the amazing Dr Jeff Feinman. 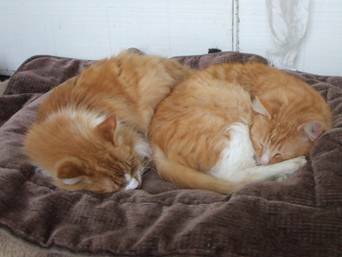 On the right feline Beauregard, At the age of 28, is seeking comfort with feline Joey. Beauregard is hopefully going to be able to take a good rest before he is once again needed as head of the household to give love, peace and comfort to anyone who is dying. BrightHaven is a healing arts center and hospice, founded by Richard and Gail Pope. 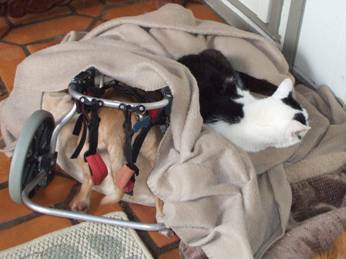 For 18 years they’ve dedicated their lives to providing senior and disabled animals a happy, peaceful, holistic place to live. The Popes live with 30 felines, 4 dogs, 4 horses, a 700lb pig named Harley, and assorted farmyard friends. Holistic care plus lots of love is their homemade raw meat food diet recipe for success. Frazier lived to be 34 years old. Here is his story. Brighthaven Feeds Feline Instincts’ My Natural Cat homemade raw meat cat food diets.